I’m a self admitted coffee snob and a chocolate snob. Oh yes, and a grammar snob as well1. And with all that snobbery in my life, I don’t feel that I can also afford to be a wine snob. So basically, I buy wines that are either from a winery that I’ve been to (because then I’ve tried it for free and know that I like it) or that someone has given to me (because then I’ve tried it for free and know that I like it). Or, when I’m feeling adventurous, I might buy something simply because I like the label2. I’d had a sample of a wine from Prospect Winery before, one time when they were giving away samples at the liquor store, and though I don’t remember what wine it was, I do remember it being quite tasty. 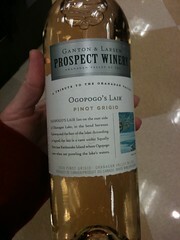 So when I saw this wine named after Ogopogo, the lake monster of Lake Okanagan, I just had to try it. Note: As per usual when I talk about a product around here, I’d like to point out that I have no affiliation with Prospect Winery, nor with Ogopogo himself. So I haven’t been paid off to write this (though if Prospect Winery wants to send me a case or two, I can totally be bought. I’m just sayin’). We just bought a bottle of this *today* because I had other wines from Prospect in the past that I liked, and I was excited to see a (relatively) small BC winery offering show up in the liquor store here in Alberta. Glad to hear it’s good. I think I’ll save it to enjoy on a warm (above 0 degree) sunny day here in Edmonton… hopefully sometime soon! What a coincidence! I hope you get your above 0 degree sunny day really soon! Let me know what you think of the wine once you try it! You need to face facts, Beth: you’re simply a snob. Period. Hmm, I currently have in my purse a reusable fabric shopping bag that came free with a bottle of wine, and a surprisingly good lip balm that came free with a different bottle of wine. I think this says a lot about my level of knowledge about wine.